Toward the end there, RPCV Sara talked a lot about how she wished she and Cale had been assigned to a more rural site where they could have immersed themselves in the community more. Group 82 left for their sites last week, and as I heard about the places they were being sent, I also felt slightly jealous. 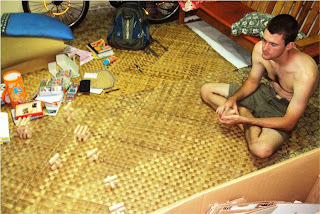 PCV Kyle is being sent to the most unreachable part of Upolu. PCV Dana is going to join Spencer and Jenny at the westernmost point in Samoa, and technically, the westernmost point in the world. But then I realized one of the great things about the Peace Corps is once a volunteer is living in a certain place—and assuming all is good between you and that volunteer and its acceptable gender-wise by village standards—you can go and sleep there for free. With school out and the weather in Apia hot as sin and my growing boredom with my own house, I’ve set out across the strait to visit Phil on Savai’i. I had a couple errands to run in Apia this morning, but I caught the 10 a.m. pasiovaa and the noon ferry and the right bus and now here I am at Phil’s. Usually trips to Savai’i are rushed for a couple reasons. First, during most of the year, school is in session, and there’s a pressing need to come on the last boat on Friday, and leave early enough to be back on campus Monday morning. Second, there’s an unofficial weekly gathering of Peace Corps in Savai’i’s main city, Salelologa, and it’s difficult to avoid the social obligation. But I’ve arrived on Monday afternoon, and there’s not really a big rush to do anything or be anywhere, and so far the trip has been quite leisure. Phil’s house sits on a little cove, and sitting around this afternoon, I asked if we could go swimming. “Yeah,” said Phil. Phil got the snorkels out while I found the sun screen in my backpack, and 10 minutes after deciding to swim, we were wading into the ocean in Phil’s backyard. When I was assigned to the heart of Apia, I was very happy, but I admit I’ve always been a little jealous of Phil’s place. He’s got a scenic view of all 4 of Samoa’s major islands, and his house is far from the dirt and grime and crowds in Apia. But I didn’t even know the half of it. The coral reef in Phil’s backyard is breathtaking. The current was strong enough today that from castoff up the shore to the swim back into Phil’s backyard took roughly 15 minutes. We did 2 rounds and saw many different types of fish and coral and anemones and stuff. I imagine it’s the kind of thing that might grow tedious after a while, but I feel like living here I’d be out there whenever the tide allowed. Afterwards we hiked up to the grocery store to pick up supplies for dinner, only to have Phil’s pule cover over and drop off barbecue. Overall, the day has been great and very un-Apia. The new open-air market in Salelologa. Jenga soon devolved into strange impromptu offshoot variations like this one here. This version was a tangible mix of Battleship and Jenga. I built 4 towers out of 50 Jenga blocks, and Phil blindly threw 4 Jenga blocks at my towers. I then got as many points as the height of my tallest tower left standing. This sounds like a lovely time. Sounds like you have island fever. Phil's place sounds really nice. Perhaps we can stay at his place next time. Does Phil have fishing tackle? Phil does not have to pay to stay nights at places like Jane's Beach Fales, he lives it every day. He will be spoiled for plain old suburban living someday, unless he can afford an ocean front place here in the states someday! I'm a Savaiian(is that a word). He must be teaching at Tuasivi College??? Savaii is much better than Upolu.